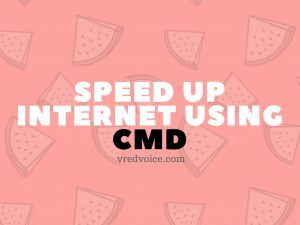 Let’s dive straight into the article on how to increase internet speed using cmd windows 7. Although this article is specifically based upon windows 7. The similar steps can also used in your windows xp/7/8 operating system. Before getting into the article you need to know that there will be a lot of reasons for slow internet speed. The most common reasons would be internet company’s server issues, old modem..etc. But, still there is always room for some optimization. So, in this article let us see the best ways to speed up your internet connection in windows 7 using cmd. Netsh is a command scripting utility which can be used to change the network configuration of your computer. Now, we will be using this netsh command to change the configuration of our TCP. Open the windows start menu and search for cmd. Once you find the cmd right click on it and click the “run as administer” option. To view the current settings of your os type in “netsh int tcp show global” and press enter. You will be show the current values set for the TCP global parameters. Chimney offload is used in transferring processing tasks from CPU to network adapter. In layman’s terms this feature is used to reduce the load in the CPU. So, it is logical that this option should be set to enabled. To do that type in the command “netsh int tcp set global chimney=enabled” and press enter, this command enables the chimney option. You can learn more about chimney offload settings at Microsoft chimney offload information. There is something called TCP receive window (RWIN) in your computer. Which determines the amount of data received by your PC without acknowledgement. Now, auto-tuning needs to be specified to tell our OS on how to handle RWIN. To change this setting type-in the command “netsh int tcp set global autotuninglevel = normal” and press enter. To understand this you need to know how data is transmitted in the network. To prevent congestion data is transmitted in small blocks by TCP. Enabling this setting helps in controlling and preventing congestion. To enable this setting type in the command “netsh int tcp set global congestionprovider=ctcp” and press enter. The above steps are the best steps to optimize and speed up your internet connection using command prompt (cmd). I’m not convinced by your “best steps” argument, I gave them a go but it appears your parameters aren’t cutting the mustard + that only ever leads to a place I certainly don’t want to end up in, but you took me there not once, but twice!!!! “Set global command failed on IPv4 The parameter is incorrect.” – This was the response I received following your last 2 commands. I thought I’d let you know, I can only assume you’re trying to help + that’s certainly admirable, sadly I didn’t benefit but it’s not all about me…….. I’m working on that, though…….